As part of the expanded lunch time routine I picked up a few luxury items to jazz up the salads. 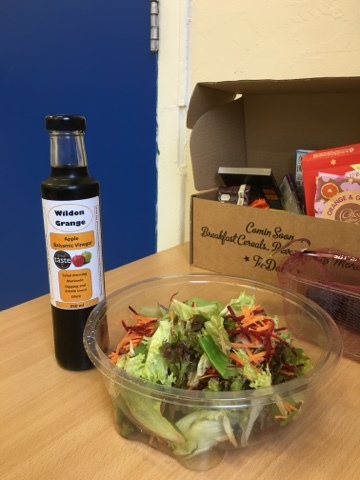 On one of our farm shop visits I got this Wildon Grange Apple Balsamic vinegar and it's pretty special. It says on the bottle that it was hand bottled by Adam which suggests it's a fairly small company, or one that names its machines. I'm not sure that I really knew what to expect going in, but the apple flavour is there as a kind of sweetness over the strong vinegar taste. Going for a large portion of walnuts in the salad was a good move as they naturally complemented the flavour. As there was no nozzle to control the pour I think my portion was a little conservative and with the nuts and big salad that I could have maybe been a bit heavier handed. I have the other half of the salad tomorrow though so I can gradually tweak it. It's probably a bit more expensive than I'd have liked at £6 a bottle, but like fine wines I think that it's nice to have a quality blend to perk up lunchtimes at work and encourage me to keep eating salads as the winter gets going.